I’ve been itching to continue with R. Scott Bakker’s The Prince of Nothing series after being impressed with his first volume in the series, The Darkness That Comes Before. It’s not an easy read: it’s complex, deep and very dark. It’s also violent, visceral and very masculine. One of the things that disturbed me about the first volume was the way women were portrayed (as prostitutes, concubines or scheming dowager empresses). 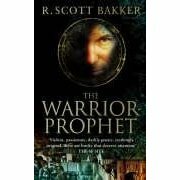 But reading The Warrior-Prophet slightly made up for it in the sense that you realise that it is central to the story (especially its resonance with Christianity, but with a twist). It also wouldn’t make sense otherwise considering the majority of characters were soldiers and the story set in a holy war with its ensuing entourage. And the men weren’t exactly angels either. There’s not much sense in reading the second volume if you haven’t read the first. So I suggest that if you haven’t yet, go and find a copy and read it, then come back and read The Warrior-Prophet. I have to admit it took me a little longer to get into the second volume partly because I didn’t read it straight after the first and you are thrust right into the story and its huge cast, many of whom we’ve met before. Drusus Achamian, the Mandate Scholar and sorcerer, is now teaching Anasûrimbor Kelhus everything he knows except for the Gnosis which cannot be revealed outside the Mandate School. However, he is torn in his loyalty as he slowly succumbs to Kelhus’ charismatic leadership. Achamian is re-united with his love Esmenet, a prostitute, who has left everything behind to follow him into the Holy War. Joining them is Kelhus’ lover Serwë, pregnant with another man’s child, but believing it to be Kelhus’. And finally there is Cnaiür, the Scylvendi barbarian and supreme strategist whose obsession with both Serwë and Kelhus’ father drives him slowly to madness. They are only a handful in a huge cast. Bakker’s ambitious canvas is epic in scope and complex in plot. Although the plot moves slowly at the beginning, we are slowly fed tantalising bits of information that together create a sense of unease that is unrelenting. There is a sense of doom and inevitability bubbling just under the surface and like Achamian, we can see everyone heading towards it but unable to stop it from happening; for Achamian believes Kelhus to be the harbinger of the Second Apocalypse. And the scariest bit is the reappearance of the Consult, the dark, creepy, non-humans that worship the No-God (who hasn’t re-appeared since his defeat two thousand years ago). Are you still with me? OK, so I won’t give anything away, it’s just a small introduction to the second volume. Bakker gives an excellent summary of the first volume, The Darkness That Comes Before, at the beginning of the second which I found very helpful and explained the differences between the various conflicting religions and regions. I did say this was complex, didn’t I? But when you read Bakker’s work, you come away richer, wiser and eager to find out more. There’s religion, philosophy, politics, war and love, everything that we humans love, hate and can’t live without. I love the way Bakker laces his story with doubt, suspicion and epiphanies because ultimately his story is about faith: in people, religion and leaders. I particularly love the idea of a religion that worships the Tusk upon which is carved the religious laws and teachings. And is it just me or does Kelhus resemble a version of Jesus Christ (albeit with preternatural intellect, speed and strength)? Like Steven Erikson’s Malazan Book of the Fallen and G.R.R. Martin’s A Song of Ice and Fire, Bakker’s Prince of Nothing cycle will make you gasp in wonder at the scope, detail and intelligent story-telling it offers. I read this for the Once Upon a Time IV Challenge. « Japanese Literary Challenge 4 is here!